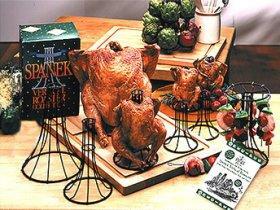 The Spanek Vertical Roaster is guaranteed to produce crisp, juicy poultry with less work. 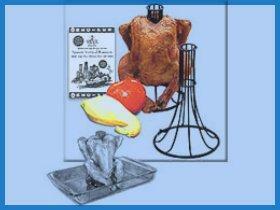 Our patented Eiffel Tower design sears the bird's inner cavity, locking in natural juices, while fat drips away. Not only is cooking vertical healthier ... it takes less time! Once you have experienced it you will never cook any other way. How good is it? It's simply the best! See what master chefs and food critics have said: "It was the juiciest turkey I'd ever tasted..." "Far and away the best roasted chicken I have ever tasted..." "It's the best roast chicken I've ever tasted, without exception, and the easiest carved..." Take a look at our latest reviews! And how easy? Very easy: "Works like a dream ... cleanup time is shortened considerably..." "Carving is much easier ..." "With four strokes the chicken comes apart in four complete pieces..."
All of our products include complete instructions and recipes — and don't miss our online help and mini-movies! So easy ... and so good! This deluxe package has it all — and is a fabulous bargain! The perfect referral or closing gift, a wonderful wedding, housewarming, or graduation present for everyone from novice cooks to master chefs. You will receive the entire collection below! Our Complete Roaster Kit gives you all you need to roast the best chicken and duck you've ever tasted — and much more besides! 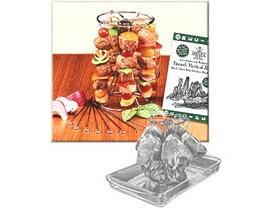 Skewer shrimp, pork chops, potatoes, corn, meat kabobs ... and cook them vertically too! A MUST for every kitchen ... the basic survival kit! 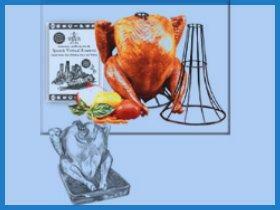 Vertical chicken is sooooooo easy to prepare, giving guaranteed juicy, tender, flavorful results. You can't go wrong! The perfect size for Chicken and Duck (up to 8 pounds). 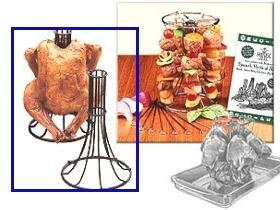 Our Conversion Kit quickly transforms your Spanek Vertical Chicken Roaster into a complete roasting kit. Skewer shrimp, pork chops, potatoes, corn, meat kabobs ... and cook them vertically while you roast your chicken — right on the chicken roaster! 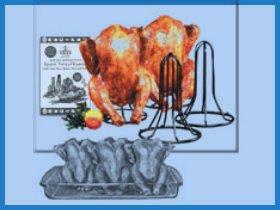 This is the kit to purchase if you already own a Spanek Vertical Chicken Roaster. If you want the complete kit including a roaster, it's here for you too! Best of all — it cooks in HALF the time! Great for BBQ. An economical crowd pleaser — roast two birds side-by-side. Two birds × 15 pounds equals 30 pounds of meat ... four drumsticks and twice the dark meat! The perfect size for Turkey or Goose up to 18 pounds. TWO for a romantic dinner — FOUR or more to entertain! Game hens are tender and succulent, and they make an impressive show when entertaining. You can fit up to four in a single roasting pan — and they're easy to prepare! Set of Two, Chrome Finish. 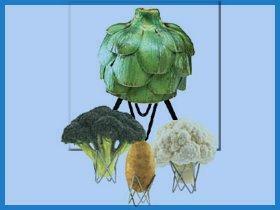 A healthier and quicker way to steam your artichokes, the Vertichoke also works beautifully with broccoli, cauliflower ... the sky's the limit! Roast your potatoes next to your Vertical Chicken. Invented for one of France's Master Chefs. Set of Four, Chrome Finish. Set of Four, Non-Stick Black Finish. Reversible and collapsible ... for perfect results! Works with all varieties of roasts! 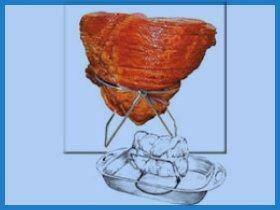 Reverse the rack to heat, glaze, and present whole or half hams -- great for spiral-sliced. This large (14" × 22" × 1") ash cutting board is reversible. Versatile. Enduring. And a great gift! One side has three inner circular rings to fit the bases of all sizes of our vertical roasters, holding them in place while you carve, and deep troughs to catch all the natural juices. The other side is flat for ordinary chopping. The board is sealed with a unique, non-toxic, FDA approved sealer that replaces the air and moisture in the cellular structure of the wood. Not Just A Carving Board — Carve On The Roaster! Our standard-sized (16" × 12" × 1") premium-quality wooden cutting board, with special rings carved into the surface to securely hold all sizes of our vertical roasters while you carve. Two trough grooves collect all the natural juices.